At the age of 12, Lina Guzzo left her home in the small town of Piazzola sul Brenta in the green plains of northern Italy to begin her cammino di discernimento, her discernment journey to become a Catholic nun. She remembered lying in bed years ago, staring at the ceiling and feeling a growing calling to join religious life. She started her journey and took her vows at 17 years old at the Missionary Sisters of St. Charles Borromeo in Piacenza, a sisterhood part of the Missionaries of St Charles Borromeo, a Catholic order dedicated to caring for refugees in Italy and abroad. Similar to what refugees crossing the Mediterranean experience today, Italian emigrants faced considerable discrimination, poverty and exploitation in the Americas. Scalabrini responded by creating parishes, schools, hospitals, shelters and cultural centers for Italian emigrants abroad. The Scalabrini Order now has operations in 32 countries across five continents. Since joining the Scalabrini, Sister Lina has worked in various regions in Italy, as well as in Switzerland, Germany, Albania, Colombia and Brazil. She now calls Reggio Calabria home, living in a modest home in the city center and working at the Giovanni Battista Scalabrini Center for Migrants. In 2015, the Center served over 1,000 refugees, providing counseling, teaching Italian and assisting with the documentation process. They also connect individuals and families with local Catholic centers and structures that provide shelter, food and clothing. Sister Lina poses for a portrait with her kindergarten students at Mons. Pio Cassinari school in Piacenza, Italy. On September 19, 1965, Sister Lina makes takes her vows to become a nun in the Scalabrini order. Here, Sister Elisa Spinelli places a cross on her neck as part of the ceremony. Sister Lina takes her vows to become a nun at the Cathedral of Piacenza. Bishop Umberto Malchiodi conducts the ceremony, where five other women are taking their vows into the Scalabrini order. Sister Lina listens to migrants in Albania as she prepares a protest with them. Together they will march to the mayor’s office to demand changes in corrupt housing policies. As part of this mission, Scalabrini would accompany emigrants on the dangerous boat rides to the Americas, hauntingly similar to those we now see in the Mediterranean. There, he would pray, celebrate the sacraments and hold funerals for the people who did not survive the journey to the New World. On one trip, he watched a young mother die on the ship, leaving behind a young daughter and a desperate husband. This compelled Scalabrini to start an orphanage in Brazil. He asked a young, pious Italian woman named Maria Assunta Marchetti to run the orphanage. Marchetti took her vows on October 25, 1985, and left for Brazil two days later, never to return to Italy. 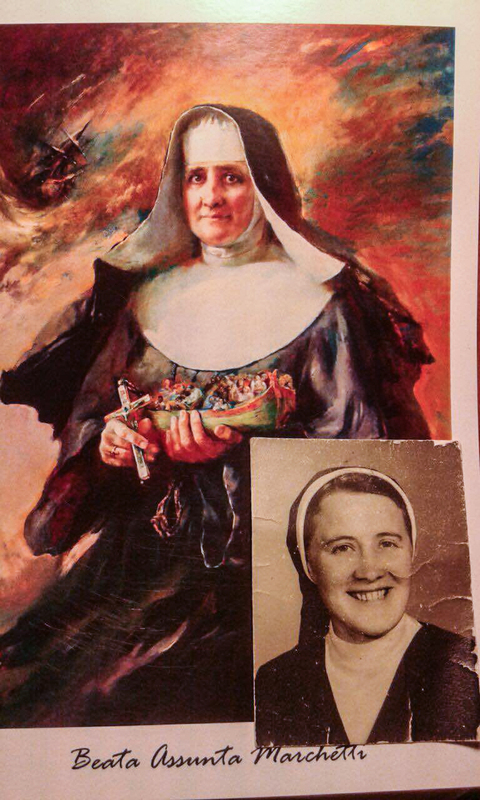 She worked tirelessly to serve Italian and African orphans in Brazil and became the cofounder of the sisterhood of Scalabrini called the Missionary Sisters of St. Charles Borromeo, the same place where Sister Lina pursued her calling. A colorful print of Marchetti clutching a cross and a boat full of refugees hangs in the prayer room of Sister Lina’s home. Other Catholic iconography lines the wall — a gold-plated cross depicting the crucifixion, a small wooden prayer altar with a worn Bible sitting on top. Each morning, Sister Lina sits in a creaky wooden chair, reciting a prayer dedicated to the work of Blessed Assunta Marchetti. For the Scalabrinians, Marchetti was an example of a woman with lively faith, committed to serving migrants in need and devoting herself wholly to God. Sister Lina says the prayer to Marchetti gives her strength and focus, especially on the difficult days when she watches thousands of tired refugees land at the port in Reggio Calabria. She said that when the refugees ask for help, she will pray this same prayer, asking Marchetti to provide them a miracle. One day after a landing at the port, Sister Lina invited us to her home. When we arrived, she greeted us with homemade vegetable soup, bread, Italian cheeses and spreads. We asked her questions about religious life and her work in Reggio Calabria. During pauses, she would fill our plates with more food, telling us, “Eat, eat!” like a mother would to her children. And she is a mother — albeit for a short while — to the refugees arriving each day to Reggio Calabria. She believes the challenges facing refugees from Africa and the Middle East are no different than those faced by Italians a century ago.